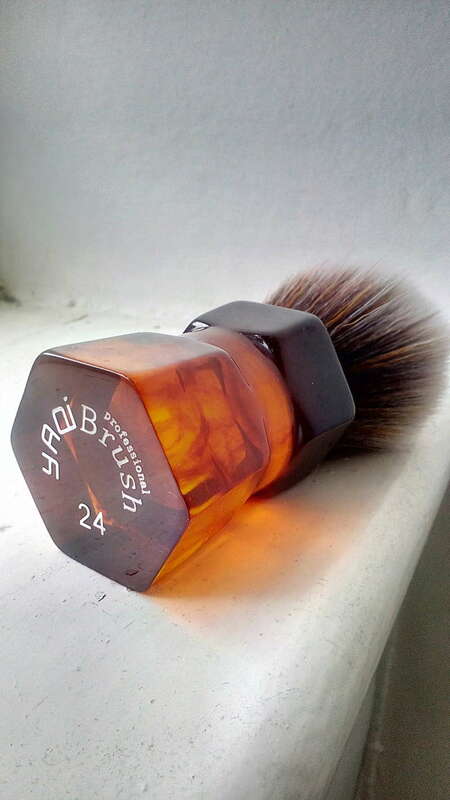 I have been waiting for this brush with impatience for several months, as soon as I saw it on Yaqi’s Facebook page. 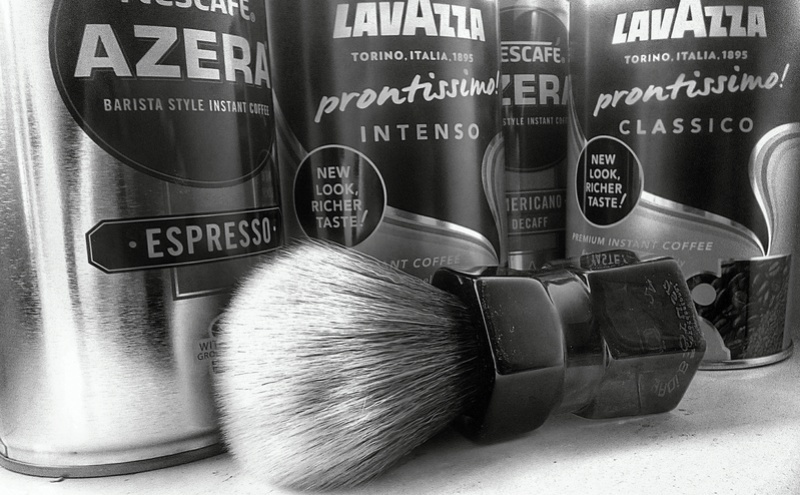 As far as I know, the idea of this brush came from an Italian client designer by trade and the handle of the brush is inspired by the Moka express coffee maker invented in 1933 by Alfonso Bialetti. After producing a certain number of prototypes, Yaqi was able to present it among their novelties at the Cosmoprof fair in Milan in March of this year. Its color in English is "mew brown", which is still hard to understand for me (mew + brown do not really make sense if literally translated). Anyway, the fibres that form it are the same (BASF type) as those used in other knots produced by Yaqi (Tuxedo and the like, with the exception of the Black Fibre). Its diameter is 24 mm for a height of 53 mm (manufacturer data); I have not checked the measurements, but they seem accurate in regard with the stocky aspect of the knot. 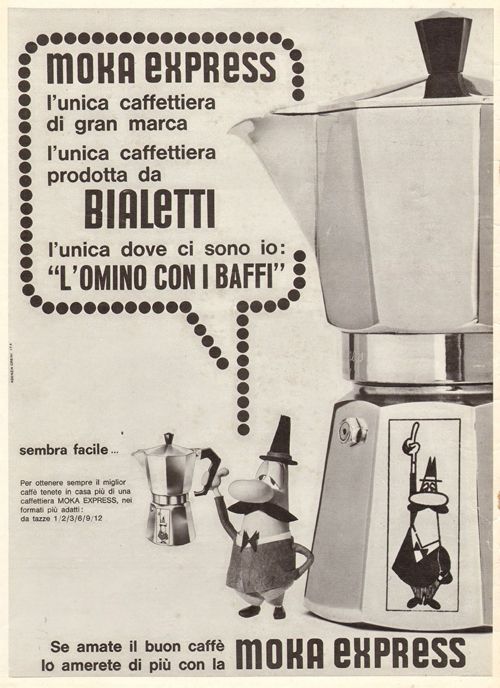 This is the piece de résistance: the homage to Bialetti and his coffee maker of which shapes and proportions were scrupulously respected. 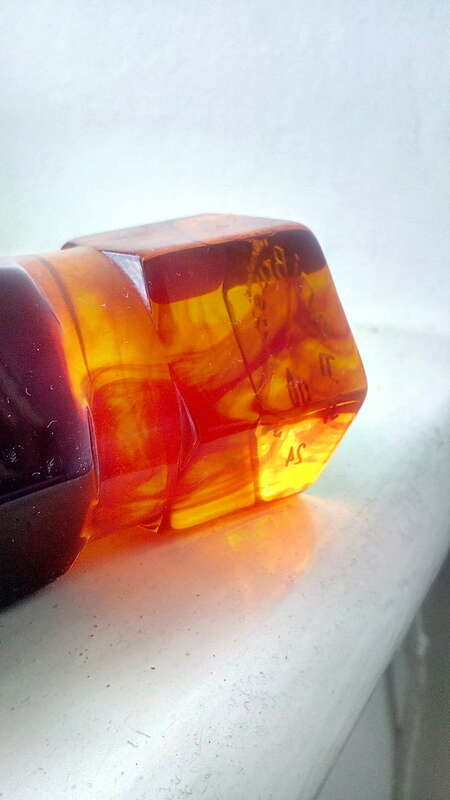 However, what triggered the impulse buy is the resin used, which imitates horn perfectly. The amber color and the transparency give a vintage touch of the most beautiful effect, giving off simplicity and sophistication. These are just first impressions, but overall, the brush behaves like any other Yaqi brushes that I have tested (Tuxedo and Black Fibre): easy lathering and abundant lather without much effort. Important note: the glue bump is much lower than in Tuxedo knots, resulting in too much stiffness; it is also the reason why I sold all my Tuxedos for a Black Fibre brush, whose the backbone is much more acceptable. In conclusion, the behavior of the Mew Brown knot is very similar to the Black Fibre. 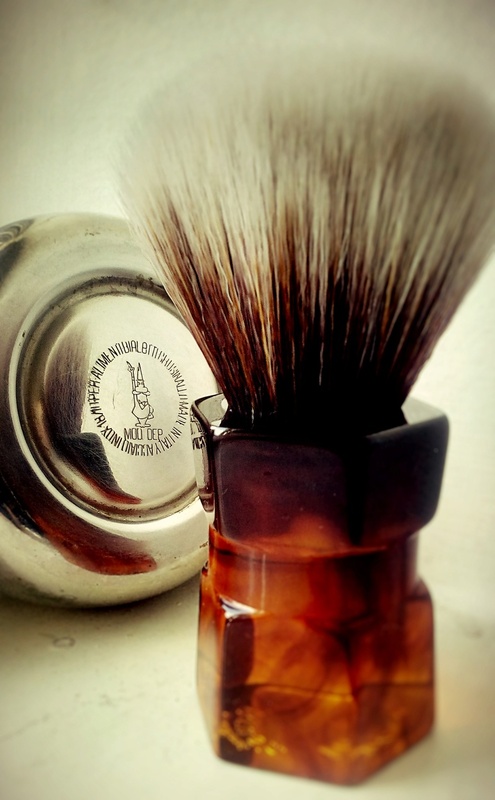 The knots does lose some hairs; I only built two lathers, but the knot lost two to three fibres each time. No big deal, but if the shedding persists, I will contact Yaqi. Despite the slight price increases of the beginning of the year, the purchase of this Yaqi brush still remains (for how long?) an excellent value for money (£18.50 shipped, delivered in 10 days with tracking and signature). 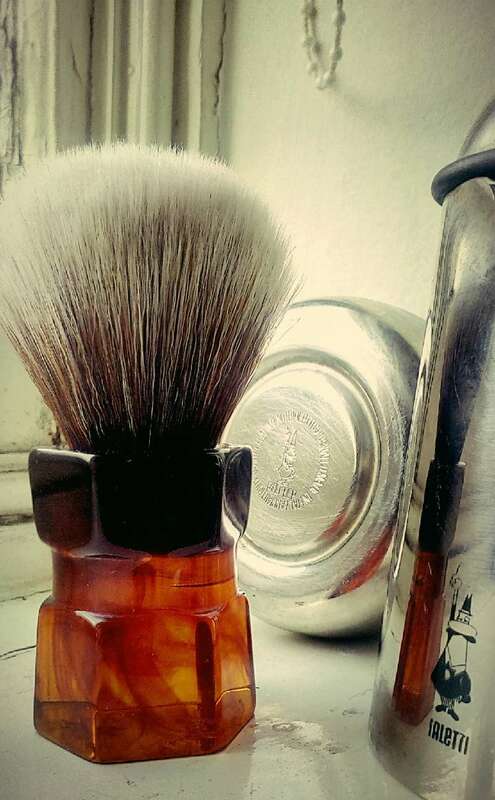 Moreover, Yaqi does not fail to stand out (diversification with razors), as much by the price as the originality of their brushes, always renewing their range regularly. 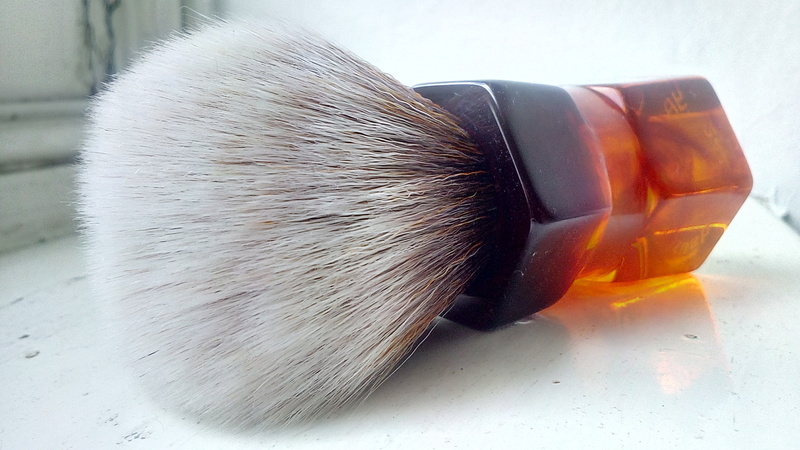 Definitely a brush that makes you want to use it and shave. My Moka Express Mew Brown arrived today and I'm in love with it already. It's damn near perfect for performance and face feel. I always struggle with MWF, living in a hard water area, but I face latheried with my new brush and got one of my best shaves ever. My previous badger brush just didn't cut it. So.... I'm a believer! It feels the right weight, and fits the hand nicely - easy to grip. Mine is 24mm/53mm and I'd say that was a perfect size for face lathering. give the knot a week for losing hairs. The fibres are very fine so it is more difficult to keep hold of them all but after few uses, the shedding stops. I must be lucky - doesn't seem to be losing hairs at all. I have one, it lost a couple of hairs at the start but none since. I only have 2 brushes, being this and the Sagrada thingy one also by Yaqi and out of the two I prefer to use the Sagrada slightly - it has a tiny bit more backbone, the Moka is exceptionally soft in every respect... But that handle, there's nothing as cool as that.